Vasco da Gama Clock when situated in Point Rd. The Vasco da Gama memorial clock located on Margaret Mncadi Avenue (originally in Point Rd, now Mahatma Gandhi) was a gift from the people of Portugal to the city of Durban and was erected in 1897 to mark the 400th anniversary of the Portuguese explorer’s voyage to India. During the voyage he discovered a large bay on the south eastern coast of Africa on Christmas Eve, 1497, which he named ‘Natal’, this being the Portuguese word for Christmas. 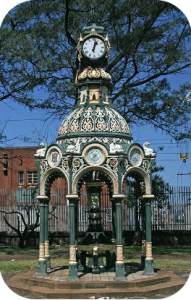 The area is today the province of KwaZulu-Natal and home to the important port city of Durban.The Vasco da Gama memorial clock was manufactured by Macfarlane’s Saracen Foundry in Glasgow, Scotland, in cast iron to a design selected from their catalogue, and is one of only three surviving examples in the world. 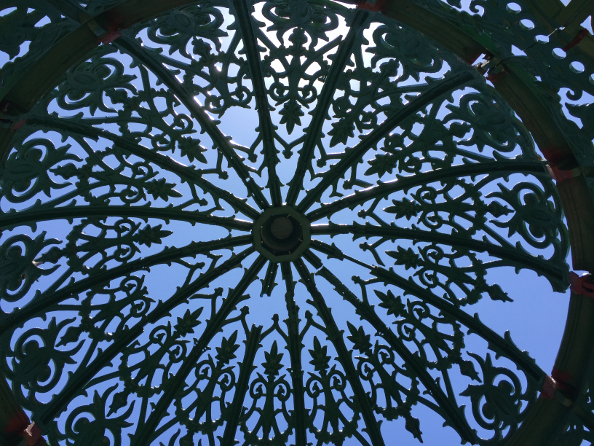 Regrettably, despite being a popular landmark and tourist attraction, the structure has fallen into disrepair. 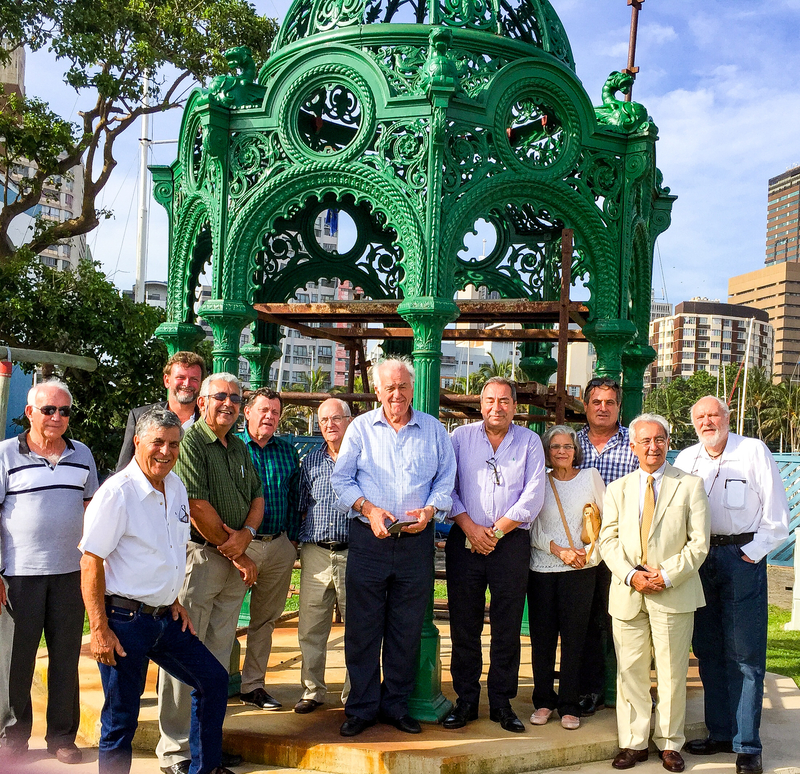 Recognising the significance of this historic structure and, in view of the importance of our maritime history and the value of the maritime industry to the city of Durban, the Royal Natal Yacht Club, initiated consultations with the Ethekwini Municipality and Amafa aKwaZulu-Natali for the restoration and temporary relocation of the structure. The Royal Natal Yacht Club has a longstanding maritime history as the oldest sports club of any kind in Africa and the oldest yacht club in the Southern Hemisphere. After two years of consultations, permission has finally been granted for the Royal Natal Yacht Club to begin the preservation project in line with the Club’s commitment to the growth and development of the Ethekwini Municipality and the provincial government of KwaZulu-Natal’s Integrated Maritime Strategy. 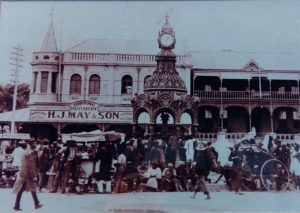 Once restored to its former glory, the clock will be temporarily located on the Club’s Ndongeni Lawns for the appreciation, admiration and enjoyment of all the citizens of Ethekwini as well as tourists and visitors. It will serve as a permanent reminder of the importance of our maritime industry and status as the trading gateway to Africa. 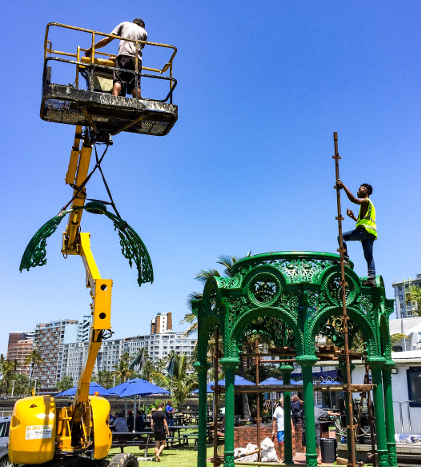 The clock is once again set to become a popular feature of Durban within the redeveloped bayside waterfront and will no doubt become a favourite setting for wedding photographs adding a new backdrop to this already popular venue.